In a time in which children are gunned down in their schools and nations hurtle towards war over differences of negligible consequence to the daily lives of their citizens, it feels inappropriate even to think of artistic tragedies. The sobering realities of politics and the evolution of culture are now more indivisible than ever before, however, and the struggles of art and artists are often educational on a broader level. Ironically, music as a commodity is accessible to Twenty-First-Century listeners in ways of which previous generations could hardly have dreamed, but music as a common language in which humanity’s troubles can be civilly discussed is understood by ever fewer artists and listeners. Counterintuitive as it may seem, the critical accent now so often missing from serious musical discussions is that of joy. A serendipitous peculiarity of music is that, whether the emotions that it communicates are exuberant or funereal, the most effective performances are those that exude the joy of using music to connect people. When this elation is absent, the most accomplished technique cannot transcend the mundane: rather than hearing music, the listener perceives notes. The musician completes a task like any other commonplace chore, and Saint Cecilia is martyred anew. In her previous recordings of solo and chamber works, the playing of violinist Francesca Dego has exhibited the pure delight in making music that uplifts an artist’s work and audiences’ reactions to it. Born in Lecco in Italy’s Lombardia region, Dego’s prodigious talent was apparent from an early age, her concert début at the age of seven having revealed a fledgling interpretive acuity that she continues to refine. A student of prestigious violinists and institutions, she perpetuates traditions encompassing fellow artists as diverse as the composer and violinist George Enescu and Ferdinand David, to whom Felix Mendelssohn dedicated his Violin Concerto. That she is a committed, thoroughly-prepared musician and an alert, insightful artist is consistently apparent, but the quality that makes these recorded performances of concerti by Niccolò Paganini and Ermanno Wolf-Ferrari equally enjoyable and valuable is the unmistakable sense of felicity that her playing of even the most contemplative passages in these works imparts. There are many violinists capable of playing these concerti and, among them, a certain number capable of playing them with true brilliance. Dego is the peer of the finest technicians past and present, but another of today’s artistic tragedies is that extraordinary technique and imagination no longer guarantee a successful career. Some careers are built upon illusions of individuality, but this disc confirms that Dego’s artistic development is shaped by the kind of magic brandished only by genuine originality. A vital influence on the adventurous course of Dego’s musical journey is surely the presence of conductor Daniele Rustioni as a like-minded companion in art and life. Any suggestions of a spouse’s tendency to indulge his partner’s idiosyncrasies are silenced by the uncompromising integrity of Rustioni’s conducting of the performances on the disc. Acclaimed for his work in the world’s opera houses, Rustioni is an ideal compeer for Dego’s musical style. In her traversals of both concerti, Dego’s playing ‘sings,’ evoking Rossinian bel canto in Paganini’s music and the Indian-Summer Romanticism of the composer’s own operas in Wolf-Ferrari’s concerto. Under Rustioni’s direction, the musicians of the City of Birmingham Symphony Orchestra perform this music with professionalism that upholds the orchestra’s nearly-century-long legacy of excellence. It is again not the distinguished caliber of the music making that lends their performances uncommon merit: it is the zeal audible in the work of every section of the orchestra that captures the listener’s attention. Unfailingly right for the music, Rustioni’s tempi are not followed by the orchestra but felt, their coordination with Dego’s playing disclosing easily-overlooked but crucial details of the composers’ part writing. In these performances, Paganini and Wolf-Ferrari receive the fully-engaged handling often reserved for ostensibly ‘greater’ composers, a result of the palpable musical camaraderie among soloist, conductor, and orchestra. With these performances, the CBSO instrumentalists prove themselves to be persuasive exponents of Italian music, and Dego and Rustioni are christened as honorary Brummies. Somewhat like Franz Liszt, Paganini has too often been dismissed as an unrivaled virtuoso whose compositions are well-written but ultimately unimportant pieces that exploit feats of their creator’s legendary virtuosity. More so in Paganini’s case than in Liszt’s, this assessment is not wholly without justification, and, in comparison with his Hungarian-born counterpart, the Italian composer left fewer works, in fewer genres, that can now be examined in pursuit of increased understanding of his artistry. Nevertheless, Paganini’s music almost always amounts to more than the sum of its parts, and those parts in the concerto played by Dego on this disc constitute a veritable litany of the skills for which Paganini was renowned. The first of Paganini’s five canonical concerti for violin and orchestra [though first published after the composer’s death, Paganini’s Violin Concerto No. 6 (M.S.75) is an early work that poses editorial questions: a previous Deutsche Grammophon release featured violinist Salvatore Accardo’s performance of Federico Mompello’s orchestration of the concerto] was likely drafted in 1817 and 1818, by which time his gifts as both performer and composer had reached their zenith. Epitomized by the twenty-four Capricci composed during a fifteen-year span and published by Casa Ricordi in 1820 (and previously recorded for DGG by Dego—catalogue number 481 0025), the contents of the arsenal of technical weapons manifested in Paganini’s music are restricted solely by the physical limitations of the violin. In Dego’s hands, the 1697 Cremonese instrument by Francesco Ruggeri with which she plays these concerti seems to acknowledge no limitations. Paganini originally composed his first Concerto in E♭ major, with the orchestral parts scored in that base key and the solo part notated in D major, enabling him to scordatura to tune his violin a half-tone higher via scordatura—a practice familiar from Heinrich Ignaz Franz von Biber’s fascinating Rosenkranz-Sonaten—but still take advantage of the resonance of the instrument’s open D string. The Concerto is now generally performed in transposition to D major, permitting today’s violinists to recreate the sonorities that Paganini intended without resorting to creative tuning. A principal goal for Paganini’s manipulation of keys in the Concerto was lofting the violin’s tones above the orchestral sound, and the diaphanous but full-bodied playing fostered by Rustioni and the CBSO facilitates Dego’s dauntless fulfillment of that aim. In the Concerto’s opening Allegro maestoso movement, the young violinist’s mastery of the wrist-numbingly difficult writing is marvelous, but she actively seeks to enhance the listener’s appreciation of Paganini’s compositional expertise by executing the most demanding passages not as sequences of tricks but as organic extensions of the melodic lines. As in the works of Édouard Lalo and Pablo de Sarasate, there are moments undeniably meant to elicit gasps of awe from the listener, and Dego never lets Paganini down, inspiring as much wonder with her dexterous delivery as the composer himself must have done. Employing a cadenza devised by Émile Sauret and improved by Accardo, she resolves the Allegro maestoso with an exhilarating musical exclamation point. The central Adagio espressivo movement is the aria that follows the first movement’s fiery recitative, and here it is Dego’s phrasing that enthralls, Rustioni accompanying her with the finesse with which he would support a Norma’s singing of ‘Casta diva.’ The Allegro spirituoso Rondo finale is the cabaletta in this quasi-operatic Concerto, and this performance of it has the clear-sighted intensity of Maria Callas’s and Renata Scotto’s portrayals of dramatic bel canto heroines. Accurate double stops, pizzicati, and harmonics and flawless intonation in chromatics are all present in Dego’s playing, but they are not used as distractions that shift the listener’s focus from the music to the musician. This performance provides abundant thrills, but, more importantly, Dego’s playing highlights the charm that shyly hides beyond the dizzying whirlwinds of notes. A native Venetian of German and Italian parentage, Ermanno Wolf-Ferrari embraced a career in music only after having abandoned his desired course of following his father into the visual arts. It is for his operas that Wolf-Ferrari is now most remembered, and in scores like Il segretto di Susanna, I gioielli della Madonna, and Sly there are perhaps glimpses of how Wolf-Ferrari’s views of musical landscapes were influenced by a painter’s sensitivity to color, light, and shadow. The cultural cross-pollination that produced the unique blossoms of his mature style parallels the similar circumstances that nurtured the work of Maurice Ravel, but, like Paganini, Wolf-Ferrari’s surviving music provides fewer pieces than Ravel’s with which to analyze his cosmopolitan synthesis of very different national idioms. One of a handful of the composer’s non-operatic works to have received even occasional attention during the seven decades since his death, Wolf-Ferrari’s Opus 26 Violin Concerto was written for American violinist Guila Bustabo, a controversial figure whose career was disrupted first by her associations with Nazi-affiliated musicians and institutions and later by the effects of bipolar disorder. Premièred in Munich in January 1944, at the height of the Second World War, the Concerto fuses lyricism with exhibitionism, the music’s soundscapes almost wholly free of the oppressive clouds of war. Dego’s performance of the Concerto’s opening Fantasia conjures an aura of wonder that is precisely right for the music—and is sustained with unexaggerated expressivity by Rustioni and the CBSO musicians. Neither Wolf-Ferrari’s music nor Dego’s playing of it is insubstantial, but the violinist approaches the Concerto with a spellbinding lightness of touch that heightens the work’s contrasts between simplicity and showmanship. The Romanza receives from Dego a reading of exquisite poise. Hers is not solely the confidence of certain technical proficiency: the assurance with which she plays this music, not least in the subsequent Improvviso, affirms that, rather than conventionally learning the music, she has absorbed it, stylistically and emotionally. As much in Wolf-Ferrari’s Concerto as in Paganini’s, the virtuosic episodes are therefore natural components of the player’s interpretation of the music. Unlike scores by many of his contemporaries, the pages of Wolf-Ferrari’s Violin Concerto are not littered with tempo markings and other directions. Thus, when Wolf-Ferrari stipulated that a passage in the final Rondo’s coda should be played ‘un poco più presto,’ it was undoubtedly with the expectation of his instructions being followed. He could find no more dutiful an exponent of his music than Dego, whose subtle observance of the composer’s wishes makes their significance all the more apparent to the listener. 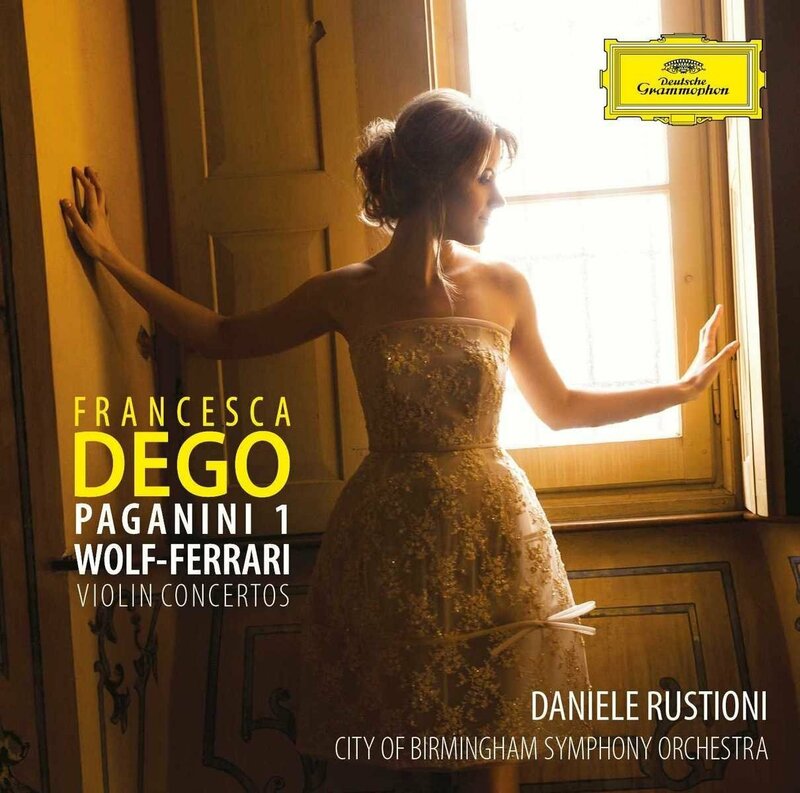 In a recording career that promises much, Dego will undoubtedly get round to the cornerstone concerti of her instrument’s repertory, but she could have selected no better work for her first recorded collaboration with an orchestra than Wolf-Ferrari’s Violin Concerto. The work’s wartime provenance notwithstanding, Dego claims this music as her own as persuasively as Jacqueline du Pré seized the Elgar Cello Concerto. Were the performances on this disc merely good, it would nevertheless be a fantastic recording, for in its seventy-two minutes the listener is invited into a dialogue in which soloist, orchestra, and conductor translate for the benefit of modern listeners the dissimilar musical dialects of composers whose works rarely enjoy thoughtful treatment. These performances are spectacular, however, validating and expanding the credentials of one of the new millennium’s most gifted violinists. One cannot survive as a soloist in Classical Music today without ego, but this disc never sounds like an exercise in building its soloist’s reputation. Rather, it sounds like Francesca Dego’s declaration of affection for an instrument and the music composed for it—and for the opportunity to share that affection with a world that desperately needs it.